This two-player card game represents the American Civil War, 1861-1865, in the theaters of war east of the Mississippi River. Each player has his own Play Deck that he will use to draw from in order to play cards. In the game, each player will go though his Play Deck twice, with each deck representing roughly two years of the war. Each player has a Command Point Track that keeps up with a player's current Command Point total (players can use coins or other tokens to mark their current total). The Command Points in this game represent the economic, military, political, and social factors that influenced the campaigns of the war, and that in turn were influenced by the outcome of the battles. 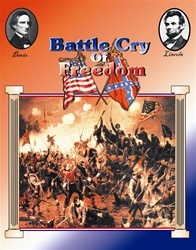 The objective of the Union player is to capture all three Victory Condition cities (Richmond, Atlanta, Vicksburg) before the end of Deck Two; or, alternatively, to take any two of these cities and play the Presidential Election of 1864 card. The Confederate wins if the Union player cannot achieve his objectives. There are four different events ac-counted for in each Play Deck, and each individual card contains at least two of these types: Resource Events, Battle Events, Special Events, Strategic Movement Events. Re-source Events (played both before and after battles) are played only during the Resource phases and they represent national morale, political events, economic and social effects, as well as the build-up of military strength. Battle Events and Special Events are played only during Combat. They are the cards that determine how a battle is fought. The Strategic Movement Phase Events may affect where a Battle Card is placed. This phase of the Sequence of Play allows for such elements as movement to the battlefield, turning movements, retreats from battle, and initiative shifting to the opponent, all of which go into determining where battles will be fought, if at all. The overall effect of the game allows the player to recreate the four years of the war within three hours of gaming. In doing so, cards representing many of the key generals of the war are used in fighting battles. Of course, the war was decided on the field of battle, but it is my hope that this game makes clear that the war was a two-way street-that battles or campaigns did not exist in a vacuum. Pea Ridge: St Louis, then Huzzah!